Well, as thouse who follow my twitter account already know, I have put the dutcho ovens away for the year. However, shortly after I put them away, I pulled them out again. Last Wednesday my daughter’s school held Parent Teacher Conference. And to show our teacher appreciation for the extra long hours, our School Parent’s Organization provide dinner for the teachers on that day. Last year my wife made a delicious Chicken Corn Chowder. And this year, I thought that it would be a good excuse to use the Dutch Ovens one last time. So, I pulled them out of storage. For this recipe, I decided that we would try one of our families favorite oven recipes in the oven. It’s pretty simple. Brown the chicken with in the butter. Coat the chicken with Basil. Saute the rice pasta mix in the the remaining fat until the pasta is brown. Then add chicken and water. Cook in 350 degree dutch oven until rice is tender (approx. 1 hour). I recommend that more heat is on the bottom for this recipe. Then add sliced tomatoes and shredded cheese to the top of mix until cheese is melted (approx. 5 minutes). For this time cooking it we used Zatarans Chick Flavored rice for this recipe, and it tasted different than usual. I think it was because the rice is different than the brand that we usually use (store brand). Also, the chicken started out partly frozen, so it ended up being very dry. However, it was delicious, and I can’t wait to try it in a dutch oven again, when I have a little more time. I promised to post this two days ago, and yesterday, so I better get it posted, or you will all have me on a stake. Right now you might think I am just talking silly, but when you eat these, you will change your mind. While on our Camp last week, we tried something that we haven’t ever had. We haven’t even had this done in a modern oven. But they sounded good. Before I share the recipe, I should let you know that we got the recipe from Rhodes Bake-N-Serv. They offer great recipes for those who buy their product. But my wife and I are too cheap to pay their price, so we just use her Fridge Dough recipe that I shared with you earlier. 3 tablespoons orange juice (we just used the juice from the orange that we rinded). Mix grated orange rind with sugar. Roll each roll into a 9-inch rope. Tie in a loose knot. Roll each knot in melted butter (was melted in the dutch oven) and then in rind/sugar mixture. Place in dutch oven with remaining melted butter. Cover and let rise until double in size. Bake at 350F for 20-25 minutes. Poor citrus glaze on rolls before serving. They were good. The only reason we had any left over was because I was full already, and I could imagine stuffing myself any more. But there were gone early the next day. I am still trying to figure out how to keep breads from getting over done on the bottom, and how to brown the tops. This time we tried flipping th rolls. This worked, but it was difficult and messy. I think that I am going to try putting more coals on top, and less on the bottom next time. Like the dinner this post is a little late. I had to work on Independence Day. Yep, I get July 5 off every year. However, the 4th is always a work day at my company. But having to work wasn’t going to take away from my celebration. We were planning to do a Dutch Oven dinner on the 4th. But I ended up working late and not getting out of work in time to start a dutch oven meal. So we went with something simple instead, and made plans to dutch oven on Saturday. Those plans were pushed off too, because we realized almost too late, that we had a baptism for my niece that I needed to go to. So, again we find out selves without a nice dutch oven meal. Sauté the the onions in the butter until tender. Then add both soups and the tomatoes. Add the chicken. Let cook for 1 hour. While you could serve this with tortillas, we went with rice. It was very good. The rice mixed with the sauce was good enough to be a meal on its own. We finished out meal off with a cherry cobbler. We used some of the cherries that we had just canned from our tree, and added a cake mix and and butter. I think we used too many cherries, because it was just a little over the top. But this was definitely a great meal. For Father’s Day my wife more than took care of me. Actually, if you ask me, she went a little over board. But, I finally have some items that I have been wanting for a very long time. So, I forgive her. I received two things that I really wanted. The first was a Camp Chef Dutch Oven Table to make it easier to cook. Now I don’t have to bend over and risk hurting my back. The other thing that I wanted was Charcoal Lighting Basket (I didn’t get the one pictured, but you get the idea). 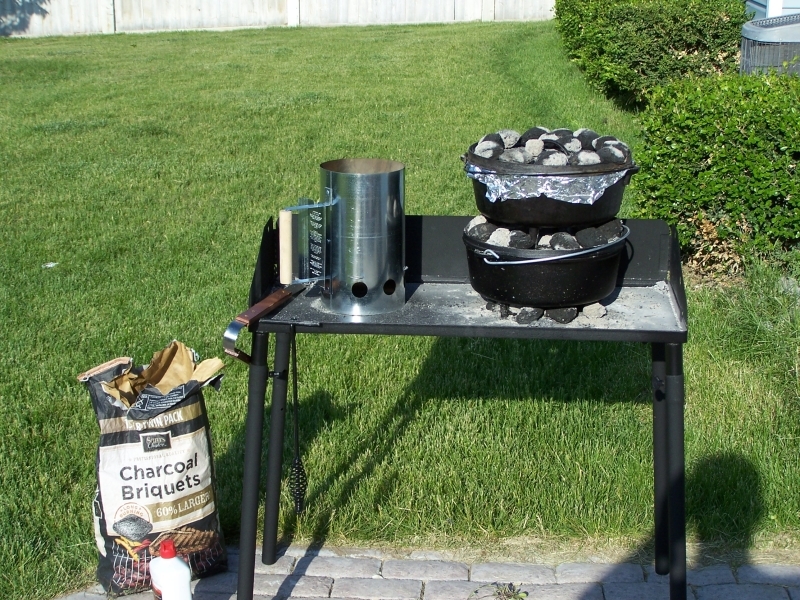 This will hopefully help me to get my coals to cook more evenly, and thus have a better cooking experience. Finally my wife got me something else that was on my list, but not as high as those two. She got me a second 12″ Round Dutch Oven. This will be especially nice when I want to cook two things at the same time. So, that’s what we did. Yesterday, we cooked up a roasted chicken. Nothing special there. Just clean a whole chicken, season it (we use seasoning salt), and then cook it in your oven. But we complemented the chicken with some fresh homemade rolls. My wife for years has been using the “refrigerator” bread dough recipe. It will keep in the fridge for up to about a week. So, you can have fresh bread almost all the time. Just let it rise, then bake it. Combine ingredients of 1 and 2 and Hot Water. Makes about 3 recipes worth. Sandy mixed all of the ingredients, and placed them in a tinfoil lined Dutch Oven. Then we let them rise in the heat of the sun for about a half-hour to 45 minutes. Then we cooked them in the Dutch Oven. It should have taken around 30 minutes, but my coals were damp, and they didn’t get very hot. I think I have finally learned my lesson to bring my unused charcoals into the garage to stay dry. I was really nervous that the rolls would be burned on the bottom. But they were, They were just shy of being perfect on the bottom. The top, however, wasn’t done as well as I would have liked. Yes, they were very edible and the flavor and texture was just fine. The only problem was that they didn’t brown on the top. They were as pale as when they were put in the oven. So, I am going to have to research and figure out the best way to brown bread on the top in a Dutch Oven. Otherwise, the meal was fine (accept we ate late again today). Okay, the title to this post is a little misleading. Because last night’s meal was nothing great. I guess, I felt that because I had been home all day that I would have enough time to start some dutch oven. But I didn’t start until 5:00 in the evening. And we had kids that needed to be to various church activities. So, I was thinking that this would have dinner done well before 6:30pm. I was so wrong. At 6:30, the chick was still raw and the potatoes were crunchy. It really wasn’t ready to eat. So, we fed the kids a small amount of left overs and sent them to their activities. Pride having set in, I decided to keep them on the coals for another half hour or hour. But somewhere in there, I knew that I needed hotter coals. So, after the hour had expired, and American Idol was half over, I broke down and put them in the oven. I know, it’s horrible. We were hungry and needed to eat. After another half hour, it was finally good enough to eat. Still some of the potatoes and carrots weren’t fully cooked, but the were still edible. 1 lbs bag of baby carrots (medium carrots cut into baby carrot size is okay too). First of all start melting the butter in the pan. Then remove the skin from the chicken. In a large bowl or plastic resealable bag mix the flour and seasoned salt. Coat the chicken with the flour mixture then brown in the melted butter. After both sides are browned, leave chicken in dutch oven and top with potatoes, carrots, onions, and cream of chicken soup. Looking over the recipe, and after a pleasant comment from my wife, I realized that I had forgotten the cream of chicken soup. There wasn’t enough moisture to cook the potatoes and carrots properly. Also, the charcoal that I used had been slightly moist from all of the rain that we had yesterday. Combine that with the wet ground, and I don’t think that my coals were hot enough to reach the needed 350 degrees. So, yesterday was definitely a learning experiences. Well, I had to skip the last couple of week in my attempt at a Dutch Oven meal every week for the next few months. It wasn’t because I was busy. It wasn’t because I am tired of Dutch Oven cooking. Nope it’s because I ran out of charcoal. Fortunately my wife sent me to the store, and I remember to pick up some charcoal. So, when I got home I had to use it. The recipe was pretty simple. Basically, through it all into the dutch oven, then bring the sauce to a boil. Then cook for about 1.5 hours at about 325 degrees. However, I think that I would have been better off to go for a 300 degree oven. The steak was a little tough, but the flavor was good. My wife made some corn bread and potatoes to compliment the meal.